I realised that I hadn't posted a saltwater page since July so I thought I'd better write something. The fact is that on the few trips I've made I have not caught much and I assume that no-one wants to read about blanks. However, there is some interest in the absence of fish. One particular spot that I fish has, over the years, been extremely consistent. Rarely have me or my pals been down there without catching a few fish and often we've had large numbers. It's a spot for mixed fishing and I'm quite sure that by using ragworm or hard crab in the hours of daylight I'd have been hauling out wrasse but my normal approach at this spot is to fish for bass, pollack, mackerel, scad and garfish. I generally start fishing before it gets light and over the years the sport has frequently been hectic before the sun came up. I take the fly rod armed with a floating line and a small Delta eel and the spinning rod with a Redgill, a shallow diving plug, a popper or a wedge. 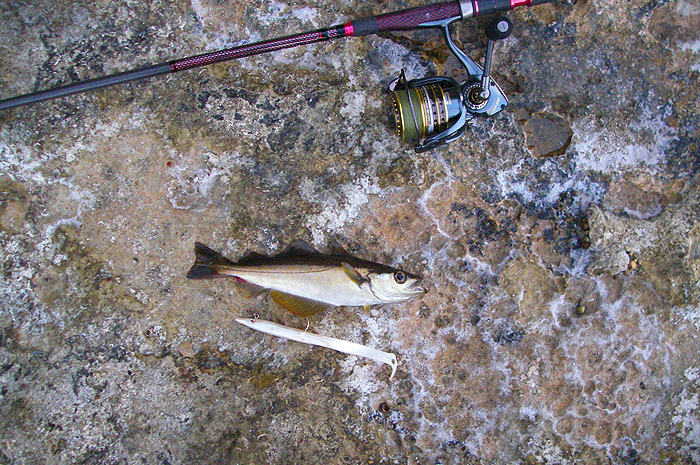 The wedge, fitted with a single hook, is my tactic for catching a mackerel livebait to tempt a big bass but it also produces plenty of small pollack and the odd schoolie. Anyway, in recent weeks I've been down there three or four times and the fish have been notable by their absence. All I've managed has been a few small pollack no sign of mackerel or bass and indeed not a hint of the baitfish shoals that are usually thick on the ground. Why do I keep going back? Well to be honest I can't believe that the fish won't turn up soon and I feel obliged to keep giving it a go. I suppose that the $64000 question is WHY AREN'T THE FISH THERE THIS SUMMER? Could it be something to do with the prolonged, mild, stormy winter? Apart from a bit of coastal erosion there's nothing different about the place as far as I can see. In any case the mackerel are usually caught from the race some way out but they just don't appear to have turned up. Several people that I've asked tell me that mackerel have been thin on the ground elsewhere along the south coast so it may not be simply a local phenomenon. This is borne out by the fact that other similar marks in Purbeck also seem to be more or less devoid of fish. Are the fish elsewhere or are they just absent? Answers on an email if anyone can solve the puzzle.